I would love to share this beautiful picture of my Grandma. It was taken last Sunday when I visited her. We went for a walk in the garden, as Grandma loves flowers and has always been an avid gardener. She was obviously very influential in the lives of all her children, as my mother and her sister and brothers have all loved gardening and kept (or keep) extensive gardens as well. Grandma will be 99 years old this June. She's mentally alert and with it, but her body is growing more frail as time goes on. She directed me to a walk-way with rails on each side. Once we got there, she got out of the wheelchair, took two steps hanging onto the rails, and then walked the rest of the length of the walk-way with 'no hands'. She was so pleased, and so was I! I cheered her on! I love you, Grandma! Very sweet! Reminds me of my Great Aunts who passed away in the last couple of years. They lived well into their 90's and both were school teachers for years and years. They were very alert, also! How blessed you are to still have your grandma. And how wonderful that she still loves math and English books. It sounds like you've spent many wonderful times with her. You're grandmother is beautiful! How wonderful you still have her with you...enjoy your time together. Both of my grandmothers are gone and I wish I had time with them again. Grandmothers must be a theme as I have just written a post about my great-grandmother. Please stop by for a read when you get time LaDonna. Thanks! Such a wonderful picture of your Grandmother. My grandma's have long been gone, but seeing yours reminds me of flowers and gardens and time spent walking amongst the boxwood trail. . . This touched a special place in my heart...we who still have grandmothers in our lives are blessed beyond measure. I so enjoyed reading more about your beautiful grandmother. What a lovely picture and what a special grandmother you have! Beautiful picture! I like the flowers in her button holes =) Your post made me miss my own grandmothers who have been gone more than 15 years now. They (and my grandfathers) all lived well into their 90s, though, so they had good long lives. how very lovely to still have your grandmother in your life! Her photo is beautiful! 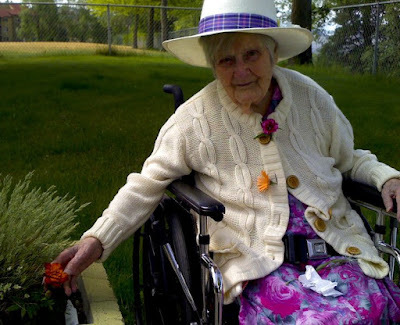 How wonderful to still have your grandmother at her age and how wonderful it is that she can still get out and enjoy the gardens.